September 16, 2013 - Under perfect weather conditions, Bombardier Aerospace celebrated the successful first flight of its CSeries aircraft today, a major milestone in the company’s highly anticipated development program that will provide operators with an all-new family of aircraft specifically designed for the 100- to 149-seat market segment. The maiden flight marks the start of the CSeries aircraft’s flight test program leading up to the first customer delivery, and was also the first flight for Pratt & Whitney’s new Geared Turbofan™ PurePower engine as part of an aircraft certification program. The historic flight of CSeries flight test vehicle one (FTV1) – a CS100 jetliner bearing Canadian registration markings C-FBCS – was conducted under the command of Captain Charles (Chuck) Ellis, Chief Flight Test Pilot, Bombardier Flight Test Center. Capt. Ellis was assisted by his colleagues, Capt. Andris (Andy) Litavniks and Andreas Hartono in the roles of First Officer and Flight Test Engineer, respectively. The flight departed from Montréal–Mirabel International Airport at approximately 9:55 EDT and returned at approximately 12:25 EDT. 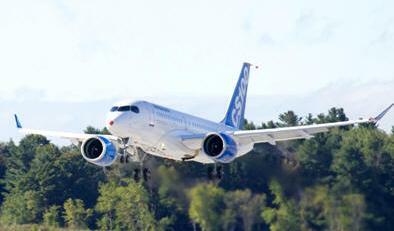 “During its maiden flight, CSeries FTV1 reached an altitude of 12,500 feet (3,810 metres) and an air speed of 230 knots (426 km/h). In-flight tests included flap and landing gear retractions and extensions; in-flight manoeuvres that included a simulated landing; and early validation of the flight control system. Additionally, we’re also delighted that many of our guests commented on the impressive and quiet performance during takeoff and landing,” added Mr. Dewar. “On behalf of Bombardier’s leadership team, I extend my gratitude to everyone who was involved in making this flight such a great success,” said Mike Arcamone, President, Bombardier Commercial Aircraft. “The patience, care and quality that has gone into the CSeries aircraft’s development program shone through today as we celebrate this milestone achievement of the first all-new, single-aisle aircraft that will revolutionize the 100- to 149-seat commercial aircraft market – with its outstanding economics, reduced environmental footprint and exceptional flying experience. “This flight takes us one step closer to putting the game-changing CSeries aircraft into service with our customers and their passengers,” added Mr. Arcamone. A total of five CS100 flight test vehicles, all of which are currently in various stages of assembly, will join the flight test program in the coming months.